When an email Campaign is sent from Campaign Monitor, the following tracking data is collected: date and time the email was sent, opened, clicked (hyperlink within the email), forwarded, bounced and unsubscribed. This information can be pulled back into Salesforce and used within reports or shown against a particular Salesforce lead or contact. Transactional, workflow or emails sent via Journey Builder are not stored in Salesforce but are surfaced via the subscriber membership record or the email activity component. Email tracking information can be viewed alongside a Salesforce lead or contact record. Each interaction is stored in a Salesforce custom object called Email Tracking History which appears as a related list on a contact or lead record. If there are multiple interactions of a certain type within the same minute, we will only store a single record. E.g. if a user (or an email client) opens the email multiple times within the same minute, then you will only see one record for the opened email for that minute. A view of the email history is also available on the Subscriber Member screen. 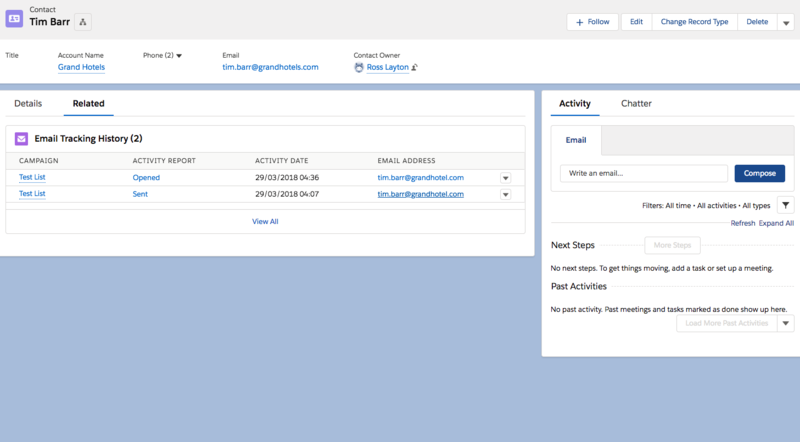 This view can show both summarized and detailed email tracking statistics (including journey statistics). The records can also be filtered by the subscriber list they were sent from. Included in our application are several custom Salesforce Report Types that allow further analysis of the tracking statistics. E.g. show me all the people who clicked on a particular link that also have a lead status equals Web. Journey tracking data is not be visible on a related list or available to Salesforce reporting. However, when you view email history on a subscriber list member we show (not store) the data from Campaign Monitor in real time this includes both Campaign and Journey tracking data. Email tracking statistic records take up space with Salesforce and will count against your overall Salesforce storage limit. The storage of email tracking statistics can be managed via our settings tab, click here to learn more. Storing email tracking data in Salesforce is a premium feature. If you switch to the free plan, email tracking data will be removed from your Salesforce org and the ability to control it will be disabled. The application will attempt to find and link the email tracking record to a Salesforce Contact or Lead. If there is no match, then the records will still be created in Salesforce (and can be used in reports etc), but they will not be connected to a Contact or Lead. When an email Campaign is sent from Campaign Monitor, the tracking data (E.g. opens, clicks etc) can be synced back into Salesforce. However syncing these tracking records can result in a lot of data and may cause issues if your Salesforce environment runs out of space. When the primary sync runs (typically every hour) Campaign Monitor for Salesforce will pull these records into Salesforce. Creating any record in Salesforce counts against your data storage limits. If you have a lot of tracking data or have already used up your storage limit this can be a problem. On solution is to use the Campaign Monitor for Salesforce Email Activity Component in Lightning. which surfaces the data instead of storing it. It currently only work with Salesforce Lighting. The component can only be added to the Contact or Lead page layouts. We surface both classic campaign and journey tracking data. Data is pulled via subscriber list memberships, if this data is not being added to Salesforce you will not see tracking data. You can view all subscriber list tracking data or use the component filter to limit to a particular subscriber list. If the contact or lead you are viewing is on more than 10 lists you will need to select a list to view (i.e. you cannot view all list tracking history due to limits). Within Salesforce Lightning, navigate to a Salesforce Contact or Lead record. Click on the Setup cog on the top right. On the Left side, pane scroll use the search components to find Email Activity. Once found drag and drop Email Activity on the page. We recommend that a Salesforce system administrator with experience working with Lighting page layouts adds the component.